Cyborg Octopus are an interesting listen to say the least. Unafraid to incorporate a myriad of elements and chaotic, virtuosic sounds, Learning To Breathe is an absolute stunner, an album that is going to crack your skull and remind you how weird and triumphant metal can be. 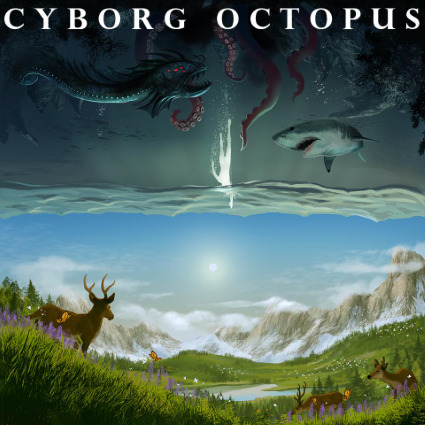 Cyborg Octopus are a fun listen, partially because they excel at being just about anything and everything. This is a prog metal band who are unafraid to make their own rules, force you to recalibrate you understanding of what this music can be. Metal has historically been about pushing limits and challenging expectations and Cyborg Octopus get that. Yes at times there sound feels a little to much like a hodgepodge of ideas, but it's a triumphant hodgepodge and once that is delivered with grace. Cyborg Octopus have the potential to change the direction of everything. They incorporate a wealthy variety of vocal and playing styles and their compositions never fail to excite. They may very well be turning the world of heavy metal on its heads, simply because Learning To Breathe is so goddamn out there, it might take years for the rest of the world to be able to catch up. Lyrical and triumphant Learning To Breathe features some of the most exciting guitar playing, mind melting vocals and thought provoking song structures I have heard in a good long while. Toss in a fairly distinct guitar and bass tone that gives the entire thing a sort of weird feel of its own and you find a group balancing shreddy madness with rhythmic obscenities worthy of Meshuggah. What gets me though is that Learning To Breathe shows Cyborg Octopus is able to traverse diverse extreme music genres with ease and find their own way through the storm.